Cambridge University was first granted two MPs in 1615. The vote was given to all members of the senate. Between 1784 and 1806 one of Cambridge's MPs was William Pitt. 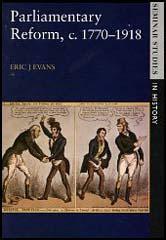 In the general election of 1826, 1,295 persons voted. In the general election of 1831, the number of voters had increased to 1,450. The poll was as follows: William Peel (Tory): 816; H. Gouldon (Tory): 813; William Cavendish (Whig): 650; Lord Palmerston (Whig): 618. Lord Palmerston, who had held the seat since 1811, was defeated as a result of him supporting the proposed Parliamentary Reform Act.